Well, it’s been almost three years since I last was rambling about this idea of making audio stories for kids. I had originally wanted to do something more involved with sound effects, so this was going to be a bigger project than I was prepared to take on, so it never happened. I keep getting emails from parents wanting help and materials to educate their kids about being Sikhs and our history. 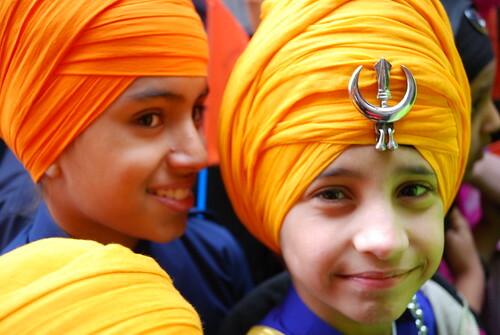 Sikh Kids having a hard time looking different, being teased that they look like a girl, etc. In these cases the kids have to learn more about why they are Sikhs and give them confidence and courage to stand tall with who they are no matter what people say to them. The few the books that I have seen that are for sale are not very good (in my opinion) and are so technical and don’t have the Sikhi "juice"…. ("In 1639 so and so was born in the village of batinda, 40 miles from patiala…"). Also books cost money and take a lot of time/money to produce/distribute and I would prefer to make this type of things freely available online so that it can have maximum impact. My son loves listening to audio stories from StoryNory.com and they are quite simple, but very nice. So, I thought why not a Sikh version of this for kids? At least once a week (or more if we can) we could record and post new audio stories so this would become a regular thing with stories of all kinds and topics (including modern sikh stories). This is the kind of thing that kids could go to sleep to (like I did when I was a kid) or listen to in the car while driving. So, now I need your help…. Stories: Find or write good stories (historical and modern) that would be understandable by young kids (10 years and younger) that we would use to record from. See details here. In addition to historical Sikh stories it would be great for people to write modern stories related to being a Sikh in this day and age. Could be related to school, life, looking different, teaching some lesson or moral. I’m looking for people in particular who can either write stories or edit existing ones, and also someone who can search out and find/collect existing stories that we can use. Story Tellers: The voice of the stories. Most of us have a decent voice, but there are fewer numbers of people that are good at story telling. We would like to find individuals who would like to help with this project on a regular basis and have dynamic voices good at telling stories (In English). My thought is that we would pick out and send them a typed up story for reading and we would help get them get setup to record the story on a computer. This would need to be someone that has a computer and internet connection. You might not think of yourself or someone as a "story teller" but might still have a good voice to do this. If you or someone you know might be interested in doing this seva and have a microphone for your computer I just added an audio/video comment feature that will allow you to record comment/story right here on the website (by the comments below click the link that says "Add Audio-only Comment"). You can record and read the below short story which will be a test and give us an idea of your story telling voice style. The Story of Chajju Ram – Upon hearing that the seven year old Guru was called Sri Har Krishan, a proud Brahmin went to visit him. He complained, "The poet in the Bhagavad Gita merely calls God Krishan, but you call yourself Sri Har Krishan. If you are such a great guru, come and translate the Gita with me." Guru Har Krishan said to the Brahmin, "I have not read the Gita, and even if I had, you would say I was just some rich man’s son who had a private tutor. Bring some ignorant peasant to discuss it with you, and when you have proved your superiority, I will speak to you." The Brabmin went out and got Chhajju, a simple water-carrier, from the nearest village. The Guru fixed his gaze upon him and said, "You are now a great spiritual scholar. Discuss the meaning of the Gita with this Brabmin." The Brahmin and the water-carrier discussed the Gita and Chhajju gave such learned replies that the Brabanin sat in dumbfounded silence. The Brahmin was convinced that Guru Har Krishan has infused his supernatural power into the water-carrier. He begged the Guru’s forgiveness and asked to be his disciple. The Guru then taught him that the first value of spiritual importance is humility"
To help with this project please contact Gurujot Singh and let us know how you can help. this is an AMAZING idea.. Two years ago, I helped out a friend, who is part of the Guru Gobind Singh Children’s Foundation in Toronto. What my friend helped to do in the organization, was compile MANY stories (on Sikhi events/Guruji stories) written by sikh youth here in Ontario. They are incredibly child-friendly, and I would love to submit mine for this purpose. I am immediately emailing my friend right now!! Often, my dad would complain how we do not engage our youngest sister (now 8) in Sikhism. He would make an attempt out to play a Sikh story (here on the archive of sikhnet.com) but my sister would soon lose interest as it was not for her age group. I feel these Sikh stories will be a success!!! i wrote to you a little while ago froma different page. i will be very happy to edit, rewrite stories for you, or if you have even raw data, i can build it into a story for the preferred age group…just let me know. if this helps, i am a professional writer and enjoy doing this kind of work! Many of you may know that Bhai Roop Singh made a cd in conjunction with the Sikh Youth Commission.Â We have extra copies of that CD which we will be happy to send out free of charge.Â If individuals can just just pay for shipping that would be great.Â They were professionally recorded and produced.Â Just email me at [email protected] and I will tell you the shipping cost to your location. This man is right.The sikhs have a right to live freely.WHEGURU JI KA KHALSA WHEGURU JI KI FATHE! Blog Revolution! - Well.... it seems like the blog seeds were planted and now blogs are sprouting all over the place! It's Blog Party!! It's cool having the local blog "